When purchasing Daylilies at the nursery all Daylilies are in 2Gal pots. The Daylilies have multiple fans and are ready to plant and flower without any digging or cutting back. There is no restrictions on when you can buy your Daylily. You may purchase them in full flower and plant them without disturbing the blooms or in early spring and be able to look forward to the flowers to emerge in your own garden. The pricing begins at 17.99 for a 2Gal pot and can be more depending on the variety. Daylies for purchase online will be dug and will be at least a double fan and are priced on our website according to variety. Selection --We select our daylilies for hardiness, quality of bloom, plant vigor, bud count and beauty. We are always looking for something different, but not at the sacrifice of plant and bloom quality. We do have favorite breeders that we seem to collect, due to the consistent performance of the dayllilies they have hybridized. 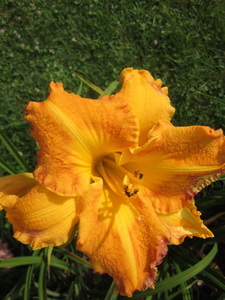 We are a young company and have limited supplies of some of our varieties, especially the new daylilies we add each year. We currently have over 400 varieties and are adding more each year. Valente Daylilies We have a large selection of Daylilies hybridized by talented local plant breeder Ron Valente. Ron left this earth too young, but left a legacy of beautiful Daylilies named for his beloved Maine, family and friends. His Daylilies out perform many in the garden and have names such as Katadin, Prescott Park, Wells Lady, Agamenticus to name just a few. Plants Unavailable If there is no price it means that Daylily variety is unavailable at this time or sold out..